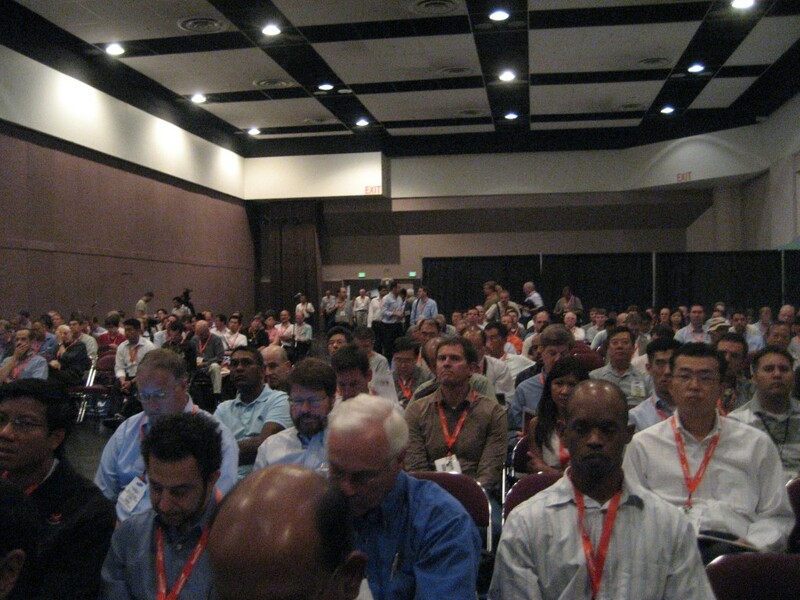 The Flash Memory Summit at the Santa Clara Convention Center got off to a great start today. The three day agenda is packed with interesting talks on all aspects of flash memory. According to Tom Coughlin, registration so far has topped 1200, a new high. The fact that half the registrations came in just the last two weeks, Tom takes as a sign people are becoming more optimistic about the economy. This is the packed house that received Ed Doller’s keynote talk at 11:30. Ed again spoke enthusiastically (that is his job) about Numonyx‘ soon-to-be-released Phase Change Memory (PCM). He was able to give a few more details this time and told us specifications are available under non-disclosure. The program for the rest of the conference sounds wonderful. Unfortunately, I have other business at the OpenSource Wold (formerly Linux World) Conference in San Francisco tomorrow and Thursday. This entry was posted on Tuesday, August 11th, 2009 at 6:40 pm and is filed under Conferences. You can follow any responses to this entry through the RSS 2.0 feed. You can leave a response, or trackback from your own site.